Our Micro roasted coffee beans, freshly ground, freshly brewed coffee serves 10+ people who are in need of a caffeine jolt. Our coffee service is complete with cups, sugars, and creamers. 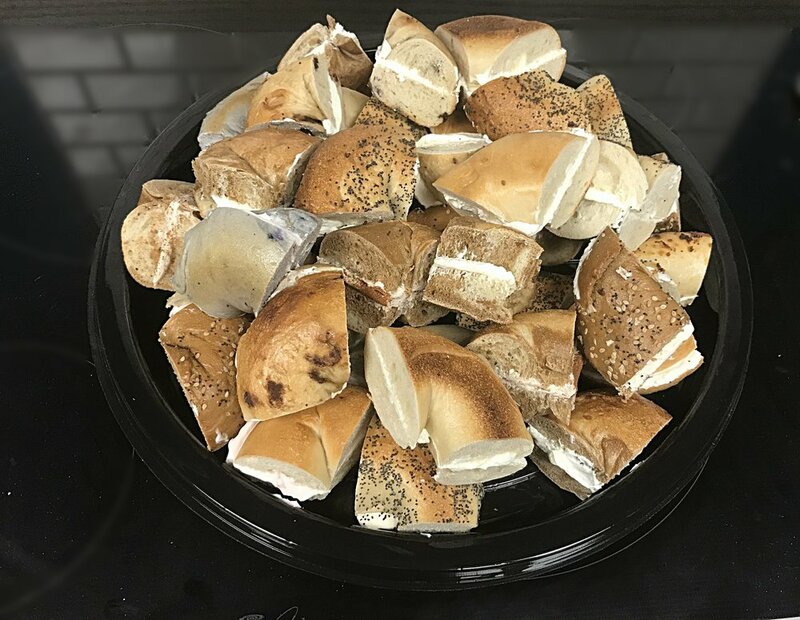 Your choice of 13 assorted bagels sliced and paired with two 1/2 pounds of our "lighter than light" cream cheese. Your choice of 8 bagels "schmeared" with an array of our housemade cream cheese. Quartered for your nibbling pleasure. Your choice of bagels, honey wheat wraps, croissant or a mixture of all, harmonized with our hand carved, herb crusted turkey breast, Waldorf chicken salad, white albacore tuna, or our famous egg salad. All served with lettuce, tomato, onion, and pickles. The newest addition to our catering selection. sliced lox and white fish salad. this tray pairs perfectly with our bagel tray. A delectable assortment of our fresh muffins, croissants, cinnamon buns, sticky buns, and more!